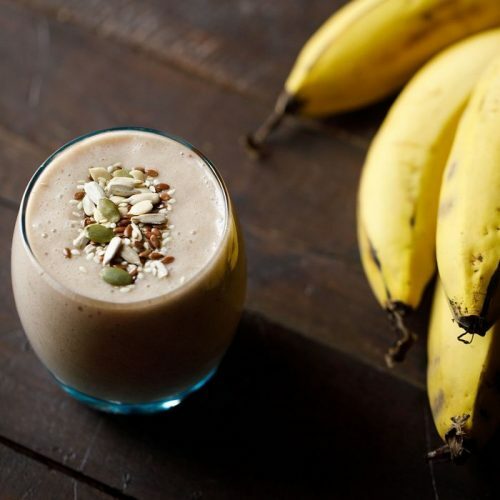 this is a healthy, delicious and filling smoothie made with ripe bananas, coconut milk and flavored with cinnamon powder. peel and chop 3 large bananas. add them in a blender. add ¼ teaspoon cinnamon powder and ½ cup coconut milk. you can even add ¼ teaspoon vanilla extract or powder instead of cinnamon powder. pour in a serving glass. sprinkle some toasted nuts and seeds. this is optional step. but it will add some crunch to the smoothie and also make it more healthy and filling.